GraTrack is a comprehensive tip tracking and gratuity management software application that replaces cash payouts and spreadsheets to pay tips on payroll. 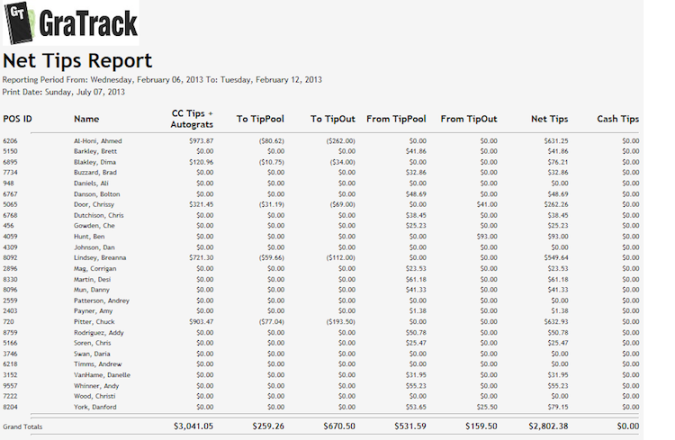 GraTrack provides several methods to perform tip pooling or direct tip. Our defined process and reports seamlessly pays tip income on payroll. Gratuity law is a very complex legal dilemma. GraTrack maintains tip compliance while using a pool or share and tracks all tip earnings. GraTrack has direct integrations with AlohaPOS ™, Micros RES3700 ™, Dinerware ™, and Squirrel ™ point of sale systems. Click to view the GraTrack application compatibility details. Gives employee access to the tip out amounts. Lookup features to view information: Tipout by Server, Bartender and Shift, and much more. Allows you to configure several tip out methods. 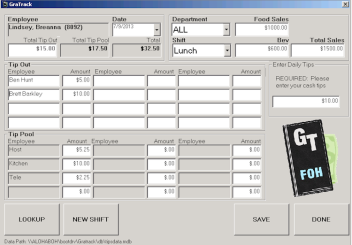 POS integration allows BOH to import configurations, labor, hours, tip amounts, and sales. Ensures accurate cash claims, employees comply with established tip program, IRS compliance, and additional tools to analyze operations. Contact us for an online demo to see what GraTrack can do for you.